On May 21, 2010 our prayers were answered! The Secretary of Health and Human Services, Kathleen Sebelius, announced the addition of SCID to the core panel of 29 genetic diseases. Our next prayer is to have the screening program implemented in all 50 states and the surrounding US territories. What is Universal Newborn Screening for SCID and why is it important? 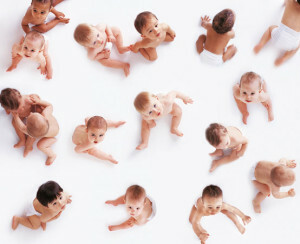 The Secretary’s Advisory Committee on Heritable Disorders in Newborns and Children (SACHDNC) developed a list of 29 core conditions that all newborns born in the United States be screened for. SCID is the first condition to be added to this Recommended Uniform Screening Panel since it’s adoption in September of 2005. When babies are born with SCID they tend to look like any other healthy infant. That’s why the passing of Newborn Screening for SCID is so important because looking at these babies on the outside you would have no idea that there is something so terribly wrong going on in the inside. Without early diagnosis and treatment, most often by a bone marrow transplant from a healthy donor, these babies will die before their 1st birthday. 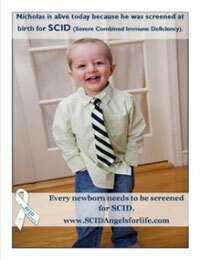 Please go to the TAKE ACTION page and see how you can help make SCID Newborn Screening Universal.